Tsawwassen is a suburban, mostly residential community located on a peninsula in the southwestern corner of the Municipality of Delta, British Columbia, Canada. Tsawwassen provides the only road access to the community of Point Roberts, Washington via 56th Street. It is also the location of BC Ferries' Tsawwassen Ferry Terminal, built in 1959 to provide foot-passenger and motor vehicle access from the Lower Mainland to the southern part of Vancouver Island and the Southern Gulf Islands. Because Tsawwassen touches a shallow bank, the ferry terminal is built at the southwestern end of a 3 km-long causeway that juts out into the Strait of Georgia. The ferry dock and causeway are part of Highway 17. Boundary Bay Airport, a major training hub for local and international pilots which also provides local airplane and helicopter service, is located ten minutes away. 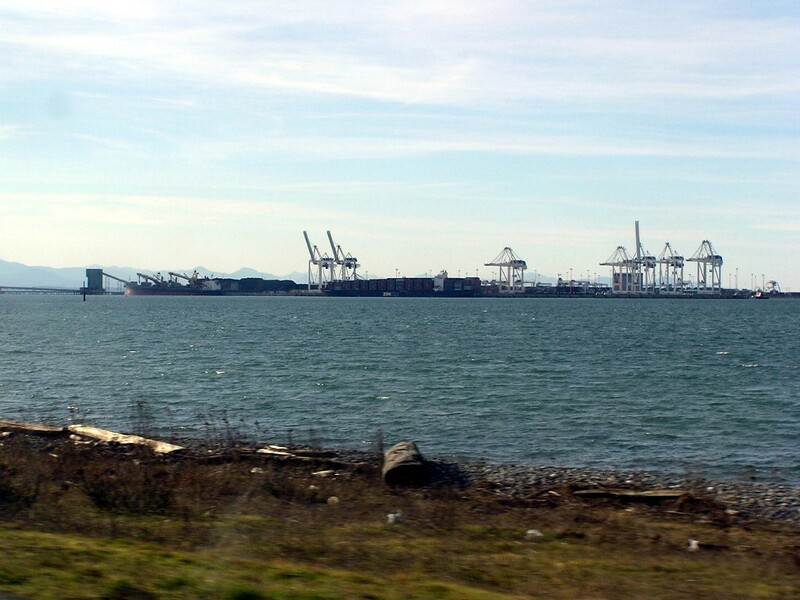 The Roberts Bank Superport is also located near Tsawwassen. To the northwest of the community of Tsawwassen are the lands of Tsawwassen First Nation ("TFN"); a people of Coast Salish ancestry. This land is bounded by the Strait of Georgia on the west, the 2600 block to the north, the 4800 block to the east, and the 1200 block to the south. While also part of TFN lands, the 92-lot residential subdivision of Stahaken was leased for use by the (then) Tsawwassen Indian Reserve to Staheken Developments Ltd., in 1989 for a 99-year term. It was then developed in a partnership between Stahaken Development Ltd. and the Municipality of Delta. As such it is commonly thought of and serviced in the same manner as other subdivisions in the community of Tsawwassen. Stahaken residents are represented by the Stahaken Homeowners Association. Tsawwassen had a population of 20,933 in the 2006 census. Tsawwassen is situated on the northern end of a peninsula flanked by the Strait of Georgia to the west and Boundary Bay to the east. Boundary Bay is an important stopover for migratory birds on what is known as the Pacific Flyway. Tsawwassen has recreational access to Boundary Bay at Centennial Park, and there is an extensive bike/foot path running along the edge of the Bay, known as the Dyke. The southern boundary of Tsawwassen is the Canada–US border with the United States, following the 49th parallel of north latitude. To the north, Tsawwassen's nearest neighbour is the town of Ladner, which is also part of the Corporation of Delta. Together, Ladner and Tsawwassen make up the area known as South Delta. Ladner is the site of the Delta Municipal Hall. Both the police station and hospital serve Ladner and Tsawwassen. Tsawwassen's lowest altitude is just below sea level, and its highest is at 70 metres at the Point Roberts border near 56th Street. Tsawwassen and surrounding lands are considered the ancestral home, and traditional lands, of the Tsawwassen First Nation, a Coast Salish people, who may have lived in the area for over 4,200 years, the age of the oldest archeological site found on English Bluff. Eight different prehistoric villages have been unearthed around Tsawwassen. The first group of Europeans to see Tsawwassen was the expedition of Spanish explorer Jose Maria Narvaez Gervete in 1791. Narvaez named the Point Roberts peninsula Isla de Zepeda and wrote that "there is an incredible quantity of rich salmon and numerous Indians... They speak an entirely different language." The history of Tsawwassen, and the municipality of Delta, is on display at the Delta Museum and Archives, in the original city hall building, on Delta Street in Ladner Village. Tsawwassen is divided up into a grid with streets running north/south and east/west. Running east/west are the avenues, numbered with 1st Avenue closest to the Canada–US border. Running north/south, the streets are numbered following the grid laid out for the municipality of Delta. This grid is part of the greater street grid set out by the British Royal Engineers in the 19th century. The main arterial street in Tsawwassen is 56th Street, which connects Highway 17 with the exclave of Point Roberts, in Washington, USA (upon which it becomes Tyee Drive). It runs through the main commercial area, centered at the intersection of 12th Avenue with 56th Street. This border crossing is the westernmost border crossing on the 49th parallel between Canada and the USA. Tsawwassen is serviced by buses from TransLink. Buses serve the main bus loop at the South Delta Recreation Centre, where many terminate at Bridgeport Station in Richmond. Since 2001, Tsawwassen has played an integral part of the Tour de Delta, a bike race that happens over a weekend in July. The racing weekend culminates in a race from North Delta, through Ladner, and then finally to Tsawwassen, where the men and women do various laps around Tsawwassen's perimeter until finishing in either Diefenbaker or Winskill Park. This race is growing in popularity and coverage with every year. For many years, people selling their cars parked and displayed them in the east parking lot of Town Centre Mall on Sunday mornings and afternoons, where they can be seen by people passing through on the way to Point Roberts. For several years, the mall has charged a small fee and provided signage and a large designated area in which to display the cars. Dozens of cars and hundreds of shoppers now come from all over the Lower Mainland each Sunday. In keeping with its reputation as the sunniest spot in the Greater Vancouver Region, every year on the August long weekend (for B.C. Day), Tsawwassen hosts the Sun Festival, which usually includes a parade, a variety of live music events and activities, such as children's games, food tents, and sporting events. There is often a specific theme to each year's event, and people are encouraged to dress the part. Boundary Bay, a quiet beach-side neighbourhood situated on Boundary Bay between Boundary Bay Regional Park and the Canada–US border. It originated in the 1890s as a seaside summer community for wealthy Vancouverites. Some of the original cottages still stand, many as renovated and updated homes, as well as modern contemporary single family homes and waterfront architectural residences. To the south, "The Bay" as it is referred to by residents, borders on the residential neighbourhood of Maple Beach in Point Roberts, WA. A Canada/US customs checkpoint joined the two communities (at the foot of 67th Street) until it was closed in the 1970s. Currently, Boundary Bay Road provides the only access route to this area. Beach Grove, which is situated on the edge of Boundary Bay, further north from the community of Boundary Bay. It is located on the east side of 56th Street, between 12th and 17A Avenue. The Highlands, which is the area just to the northwest of Downtown Tsawwassen, behind the Town Centre Mall and situated around Highland Park. Pebble Hill, which is the area surrounding Diefenbaker Park and Pebble Hill Park. Tsawwassen Heights, a small area located on English Bluff Road, south of 1st Ave. Two totem poles stand on either side of the road here as its official gateway. The Terrace, a terraced subdivision located between 56th Street, the Tsawwassen Nature Reserve, and the Canada–US border. English Bluff, which refers to the area along English Bluff Road, where many of the most expensive homes in the community enjoy commanding ocean views. Stahaken, which refers to a large area of houses built on land belonging to the Tsawwassen First Nations. This land is leased on a 99-year term to Stahaken Development Ltd., and supported by serviced by the Municipality of Delta. The current lease expires in 2089. The Village; adjacent to Stahaken, it is a wealthy subdivision built on the west side of English Bluff Road, overlooking the Strait of Georgia. Another totem pole stands at its entrance at Wesley Drive. Tsatsu Shores, a large apartment complex beneath English Bluff, on the shores of the Pacific Ocean. This is also built on land leased from the Tsawwassen First Nation. Imperial Village, a large subdivision located east of 52nd Street at 16th Avenue. Forest-by-the-Bay, which refers to a housing development off 56th Street and 6th Avenue beside Tsawwassen's only cemetery. Public schools in Tsawwassen are part of School District 37 Delta. Tsawwassen has only one public high school, South Delta Secondary School (SDSS), formerly South Delta Senior Secondary. There are five public elementary schools in Tsawwassen. These are Cliff Drive, Pebble Hill, South Park, English Bluff, and Beach Grove. A sixth school, Boundary Beach (Grades K-3), closed in June 2009. There is also a small French programme cadre school, Ecole Du Bois-Joli, for students with French language spoken at home. Boundary Bay Elementary School, formerly located on 56th Street south of 12th Avenue, served grades K-7. With usually one class per grade, it was a small school, and shared a principal with Boundary Beach Elementary School. Grades 3-7 students from Boundary Beach were bussed daily to attend the school. The school was closed in the early 1990s, and the land sold. It is now a residential development. There was also a middle school called Tsawwassen Junior Secondary (TJS), but low enrolment led to its closure in 1994. This land was also sold by the school district and re-developed into a housing subdivision. Private schools in the Tsawwassen area include Southpointe Academy, a private K-12 school; Delta Christian School in Ladner, a Christian private school offering grades K-8; and Sacred Heart Elementary in Ladner, a Catholic school offering Grades K-7. Diefenbaker Park - located at the intersection of 56th Street and 1st Avenue, named after former Canadian prime minister John Diefenbaker. One of the largest parks in the area, it has many features - open spaces and large hills, a waterfall, dock, and pond, a very large forest, playgrounds, restrooms, and many gardens. The steep grade from the surrounding streets into the centre of the park makes it especially popular during Tsawwassen's rare snow falls, for sledding and tobogganing. In Summer 2011, the Rotary WaterWorks Playground was built. This water playground was created with environmentally friendly materials. The WaterWorks project was a collaborative partnership of the Corporation of Delta and the Rotary Club of Tsawwassen. The concept draws on the history of the site, a former gravel mining operation that, at one time, supplied much of the gravel for the development of Tsawwassen. Pebble Hill Park - located west of 52nd Street between 2A Avenue and Milsom Wynd. This park features large fields used for sports (baseball and soccer), tennis courts built atop a pair of water reservoirs, and many forest trails. Fred Gingell Park - Tsawwassen's newest park, located on English Bluff Road just south of 3rd Avenue. It is named after the former MLA who represented South Delta in BC's legislative assembly. Built on a BC Hydro right-of-way, this park sits on the top of a high bluff overlooking the Strait of Georgia, the ferry terminal, and Vancouver Island. An observation deck is built on this bluff, and a stairway and trail have been built down the bluff to Tsawwassen Beach below. It is the first (and only) public access to the beach, creating controversy as semi-private beach access contributed a great deal to the area's property values. Winskill Park - located at 56th Street and 9th Avenue, named after the land's donor and one of the first families to live in Tsawwassen. This is Tsawwassen's all-purpose sports park, featuring numerous baseball diamonds, soccer fields, and field hockey fields. A fenced artificial-turf outdoor soccer field was completed in 2007. Also features a walking trail, disc golf course, restrooms, youth centre, playground, and the Winskill Aquatic Centre. Dennison Park - located across from the high school at the corner of 53rd Street and 7A Avenue. This park used to feature an outdoor pool, but is now primarily used as a sports park for the high school football team. Also used for soccer and baseball. A forest grows on the northern half of the park. Village Park - a very small community park located on Wesley Drive at Skana Drive. Mostly green space, but also features a playground. Brandrith Park - another sports park, adjacent to Cliff Drive Elementary school, at the corner of 12th Avenue and Winskill Drive. The focus here is primarily on its baseball diamond, but a soccer field and tennis courts are present as well. A forest can be found to the rear of the park; a large playground can be found at the adjacent schoolyard. Highland Park - mostly open green space with a light forest, located at the corner of 55th Street and 13A Avenue, in the heart of downtown Tsawwassen. Grauer Park - another heavily used park, located at 56th Street and 18th Avenue. Greenspace here is minimal. The park is best known as home to the South Delta Rec Centre (featuring an ice rink, curling rink, and gymnasium). The Kiwanis Longhouse (once the South Delta library) is in this park, and is now an art gallery. Also featured here is parking for the Tsawwassen Park and Ride, the Tsawwassen Skate Park, and a lacrosse box. Jackson Way Park - a grassy greenspace, found at the southern end of Jackson Way. Beach Grove Park - mostly forest, found at the corner of Braid Road and 17A Avenue, adjacent to Beach Grove Elementary school. This park once featured a giant checker board and checker pieces visitors could play with. Also features tennis courts. Imperial Park - an open field underneath the BC Hydro right-of-way in Imperial Village, at the corner of Spyglass Crescent and Silverado Place. Features a baseball diamond, playground, and a decent hill used for sledding/tobogganing in the winter. Beach Grove Mini-Park - a very small community park on Beach Grove Court, featuring a small playground. View Crescent Park - a very small greenspace joining the southeast corner of View Crescent with the north end of Hunter Road, located behind a commercial complex in downtown Tsawwassen. Tsawwassen, like the whole of the Municipality of Delta, was initially only serviced by Delta Cable (since sold to Eastlink) for TV and cable internet services, although Shaw now offers its service offerings as well. As in all of British Columbia, incumbent telephone services is provided by Telus; the area codes serving Tsawwassen are 604 and 778 - though the latter is primarily used for cell phones. The original CO Code servicing Tsawwassen was 943, but as the population expanded, a new code, 948, was introduced in the early 1990s. New codes have since been added, and local number portability has blurred traditional exchange differences. Phone calls within Tsawwassen or the entire 604/778 region must adhere to the process of 10-digit dialing. Tsawwassen is home to the largest shopping centre in South Delta (Tsawwassen Town Centre Mall). Other businesses in Tsawwassen are Save-On-Foods, Tim Hortons, McDonalds, White Spot, Thrifty Foods, Shoppers Drug Mart, Dairy Queen, two Starbucks and many more. On April 29, 2009, the Tsawwassen Town Center mall experienced a fire, closing a large percentage of the mall, as a result of complications involving a roofing contract. Anonymous management in the complex claims the delays in the reconstruction of the damaged areas are due to asbestos insulation. Tsawwassen is known for its relatively dry and sunny climate compared with other locations in Metro Vancouver. For example, it receives nearly 40% less precipitation than downtown Vancouver. As typical of the Vancouver metropolitan area it has an oceanic climate with cooler summers and milder winters than other areas on the Canada–US border. Due to the drying trend in summers, it has a cool-summer Mediterranean tendency, but winters are cooler than the Mediterranean climates experienced on more southerly coastal locations.